I love shopping at Central Market. It’s a good idea to go on an empty stomach, as they are always sampling a ton of delicious food. I was picking up some fresh basil when I saw a woman putting together skewers of tomato, basil, and mozzarella. 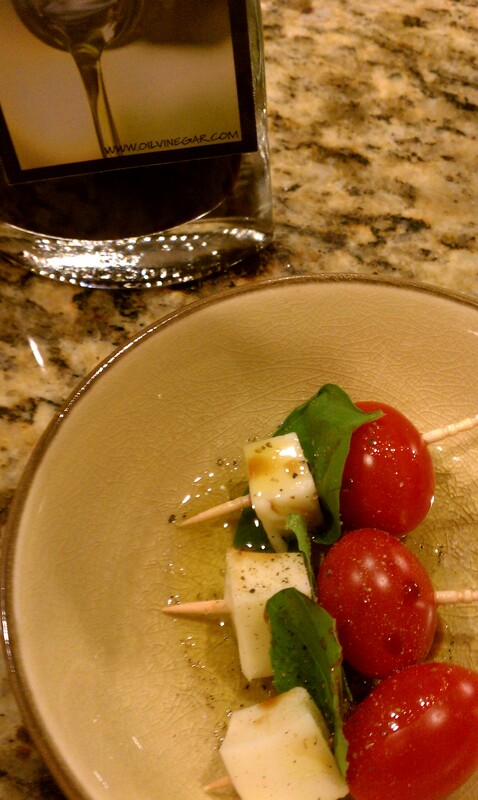 After enjoying my little treat, I decided we definitely had to have Caprese Pops as our salad with dinner. This dish (I’m not sure you can even call it a recipe) was easy enough to assign to my seven and four-year old daughters — and they loved making them. I set out grape tomatoes, basil leaves, cubes of mozzarella, olive oil, balsamic vinegar, a grinder of sea salt (I like Maldon), and pepper. They did the rest. It seemed the tomatoes were magically removed from their skewers after reaching the dinner table, but I was happy that they at least tried them.